In 2004, when I first started writing my book I also made a web page with a timeline of the islands economic collapse following Hurricane Iniki negatively impacting the rest of the state at www.kauaishotels.info. When I made it I had no knowledge of Burns or Foley or for that matter much information about Baldwin. In 2006, after I started finding out about Burns along with Foley and at that time I realized the only history I knew was what I read in the papers, along with the litigations I was involved with. I realized that this history was completely inadequate. With that I went back to the newspaper archives particularly that of the Kauai Times, the newspaper that first mentioned Mr. Baldwin in an article in 1991. This was after he was appointed by Peter Herndon, then head of the Kauai office of the Hawaii Visitors Bureau to work on a report with Kirsten Baumgart Turner of the Office of Economic Development to find ways to improve tourism on Kauai. KT Pre Iniki In the immediate aftermath of Iniki there was a strong push to reopen the hotels; they knew how important they were to the economy. The KT 93 post Iniki shows how they were all projected to reopen by mid 1993 along with economists projecting boom times for the island. KT 93 Post Iniki This appears to have been around the time that Baldwin started getting directly involved with the Kauai Economic Development Office, around the time that they realized that the study needed to be updated. 1992 Kauai Economic Development The following year however this all changed, and the information coming out was all over the place. Two separate articles gave two different reasons for the problems at the hotels. One had Baldwin and some of his associates attacking Kirsten Baumgart Turner who had left the County for a state position blaming the state. Another had the Mayor blaming absentee owners. KT 93 And in 94 it showed another twist with the GM at the Sheraton Kauai blaming the Trust. This was around the time that one of the lawyers representing one of the Trusts finally wrote a letter to then Planning Director Dee Crowell asking what could be done to resolve the issue also copying the head of the office of Emergency Permitting. 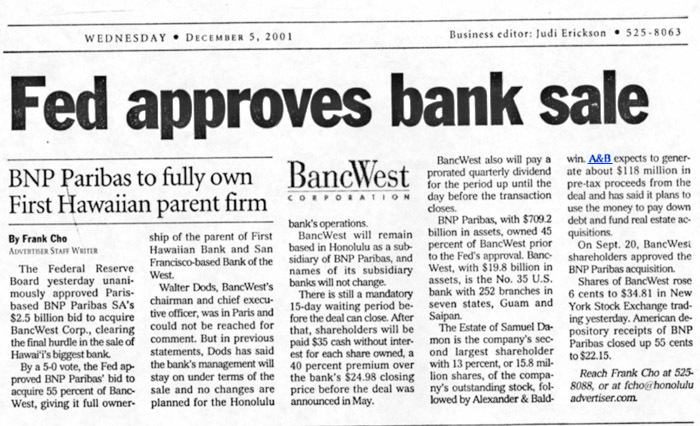 The Sheraton Kauai was on land owned by two trusts overseen by Hawaii’s two largest banks trust departments. The head of OEP sent a long detailed letter as to what could be done directly back to Dee Crowell which the attorney representing the Trust eventually got a copy of, as a result of which people were deposed, and this lawsuit was resolved. KT 94 Sheraton Damage In the documentation supporting the sale of Grove Farm to Steve Case there was a little blurb about Hawaii’s economy that said something to the affect that in the initial aftermath of Iniki the economy was rejuvenated but as time went on and the hotels remained closed the economy became stagnant. Some people may remember that economy, it was downright brutal, as a result of which we had three exoduses off island. The first was immediately following Iniki with people who lost homes or jobs and didn’t have any ties to the island left the island. Some people found the damage overwhelming and couldn’t handle it, mental health professionals were on Kauai in force to help people cope. Reports indicate a large segment of our society was suffering from PTSD as a result of first the hurricane, following by having to cope with the damage. The second exodus that occurred was shortly after Maryanne Kusaka was elected Mayor. She ran on the platform that she was going to get the hotels reopened and almost immediately upon being elected she visited the hotel operators. Shortly thereafter she came back admitting defeat, the fear was palpable, a lot of people had been hanging on by a thread and many of them threw in the towel leading to our second exodus. The final exodus occurred as a result of all of the foreclosures. People could buy homes for change on the dollar, shutting down the building industry, as a result of which many builders left for greener pastures as well. Kauai Times 95 Once I found out about Burns and then from a few people who he was connected to, and then the Lull debacle unfolded along with his connections I was hoping to see if anyone else might be able to connect some dots as well. “Con men” are anything but funny, the damage they can wreak upon individuals and their families, along with communities, is staggering, but it is what it is. The elderly of course appears to be one of their primary targets, but then there are the trust fund babies along with the nouvea riche, it also appears they can easily manipulate those in power. People with little sophistication appear to be easily pulled into their con with catastrophic consequences. If anyone knows of connections in addition to the ones I listed if you would contact me through the contact form below I would be very grateful, everything can be entirely off the record.